It is my contention that “MYSTERY BABYLON THE GREAT, THE MOTHER OF HARLOTS AND ABOMINATIONS OF THE EARTH.” in Revelation 17:5 is a prominent city in Arabia. The city called Mystery Babylon is described as a city in the desert by the sea (Isa 21:1) . It is also described as “the mother of harlots (Rev 17:5)“. In the Bible harlots typically represent false religions. The strongest argument for Mecca as being Mystery Babylon is that Mecca is the world seat of Islam. Mecca also has the largest building in the world and almost the tallest. Mecca itself isn’t a port city. Mecca is about 45 miles east of the Red Sea port city of Jedda. The name Mecca actually means Mother so maybe we should just stop looking elsewhere for the Mother of Harlots. Dubai is another city of interest because it is located on the Persian Gulf and has one of the worlds wealthiest seaports. Also Dubai has the worlds tallest building. You may read my treatise titled “Dubai: a Case for Mystery Babylon”. This commentary looks at the very day and very way of the destruction of “that great city” described in Revelation 17:18. Just like ancient Babylon, the modern city called Mystery Babylon will be in the midst of a drunken party when its destruction comes suddenly! You are probably familiar with the story of the fall of the ancient city of Babylon (Dan 5:1-6). The once powerful Babylonian empire was on the brink of failing. The king in Babylon was bunkered within the city gates with his princes. The princes were gathered to the city of Babylon because their regions were already overthrown by the Medes and the Persians. The city was the last stronghold of the Babylonian Empire. The Medes had besieged the city for months, and were about to break through its walls. Belshazzar, king in Babylon was yet prideful. He thought that nobody would conquer the walled city. In an effort to demonstrate his self-confident supremacy he decided to host a party. At that time the people of Israel (that is Judah) were captives in Babylon. Belshazzar further demonstrated his preeminence by drinking from the holy vessels taken from the Jerusalem temple. 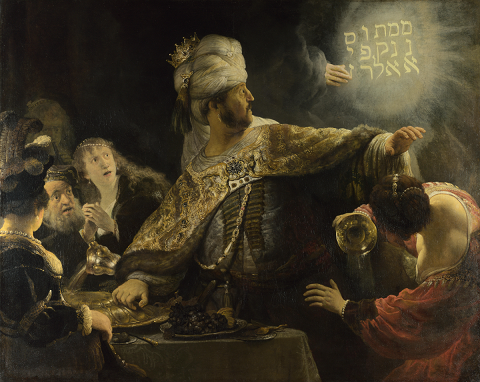 During the drunken party Belshazzar noticed a disembodied hand over by the punch bowl, writing a salutation on the wall. MENE, MENE, TEKEL, UPHARSIN (Dan 5:25). God hath numbered thy kingdom, and finished it. Thou art weighed in the balances, and art found wanting. Thy kingdom is divided, and given to the Medes and Persians (Dan 5:26-28). That very night the Medes and Persians overran the city of Babylon and King Belshazzar was killed. That night the Mede and Persian Empire conquered the Babylonian Empire (Dan 5:30-31). In much the same way Mystery Babylon will fall in the future. There is a principle in Bible prophecy; that some prophecies have two distinct applications. They apply to two separate events usually separated by time. This is the case with several prophecies regarding the demise of ancient Babylon. They also apply to MYSTERY BABYLON. Mystery Babylon is a city that exists during the Great Tribulation. We are going to look at a section of scripture in Isaiah that pertains to the fall of ancient Babylon, and then a section in Jeremiah. Let’s start by looking at Isaiah. Isa 13:6-11 Howl ye; for the day of the LORD is at hand; it shall come as a destruction from the Almighty. 7 Therefore shall all hands be faint, and every man’s heart shall melt: 8 And they shall be afraid: pangs and sorrows shall take hold of them; they shall be in pain as a woman that travaileth: they shall be amazed one at another; their faces shall be as flames. 9 Behold, the day of the LORD cometh, cruel both with wrath and fierce anger, to lay the land desolate: and he shall destroy the sinners thereof out of it. 10 For the stars of heaven and the constellations thereof shall not give their light: the sun shall be darkened in his going forth, and the moon shall not cause her light to shine. 11 And I will punish the world for their evil, and the wicked for their iniquity; and I will cause the arrogancy of the proud to cease, and will lay low the haughtiness of the terrible. Remember that these verses pertain to the judgment of Babylon. The above verses describe “the day of the LORD” (Joel 2:31). “The day of the LORD” occurs during, and at the end of the Great Tribulation period in the future. So evidently this verse also applies to future events. As we saw earlier, the Medes and Persians did overthrow the city of ancient Babylon. It occurs to me that they might also overthrow Mystery Babylon in the future. The Persians (or Elam) today is Iran. Iran is the arch enemy of Saudi Arabia. The Medes are today’s Kurds! The verse above applies much better to Arabia than it does to Babylon in Iraq. The original city of Babylon is nowhere near a sea. I think that “Mystery Babylon” will be destroyed by Iran, perhaps with the assistance of the Kurds; just like ancient Babylon was destroyed by the Medes and Persians. I am certain that Mystery Babylon is a city in Arabia. Mecca is the number one suspect since it is the seat of Islam. Dubai is another candidate. Dubai is on the Persian Gulf in the Saudi desert. Also notice that the whirlwinds come from the desert in the south. That is true for Dubai but not as true for Mecca. In Iraq the desert is on the west. 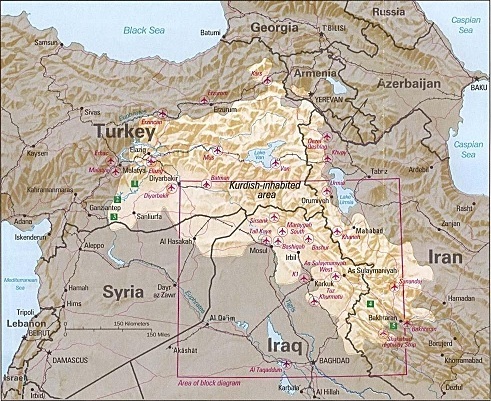 The Kurds live in northern Iraq, eastern Syria, and eastern Turkey. They have separate status from the rest of Iraq. The Kurds have their own government and military. The Kurds are the ancient Medes. Isaiah 21:2 above describes the past destruction of Babylon and also the future destruction of Mystery Babylon. I think that Mystery Babylon is most likely Mecca. The Kurds and the Iranians will destroy Mecca! This describes Belshazzar’s reaction to the writing on the wall. This same language is used to describe the fear of the nations in “the day of the LORD” (1Th 5:3, Jer 49:22). Isa 21:4 My heart panted, fearfulness affrighted me: the night of my pleasure hath he turned into fear unto me. 5 Prepare the table, watch in the watchtower, eat, drink: arise, ye princes, and anoint the shield. Above describes the banqueting of the princes of Babylon. Their party was interrupted by an invasion. I suspect that like ancient Babylon, Mystery Babylon may be in the midst of a drunken party at the moment of their sudden demise. This same language that describes the fall of Babylon here also describes the fall of “Mystery Babylon” in Revelation 14:8. Now let’s look at Jeremiah. People are warned to come out of ancient Babylon above. They are also warned to come out of Mystery Babylon during the Great Tribulation in Revelation below. Belshazzar’s party guests drank from the holy vessels taken from the temple in Jerusalem. Likewise God has used Babylon and its philosophy of idolatry and world conquest to pollute the nations since. Any party that is pressing toward “the New World Order” or “One World Government” or “world dominance by religion” or “any world empire, or Caliphate” is drunk with Babylonian wine. Jer 51:8-9 Babylon is suddenly fallen and destroyed: howl for her; take balm for her pain, if so be she may be healed. 9 We would have healed Babylon, but she is not healed: forsake her, and let us go every one into his own country: for her judgment reacheth unto heaven, and is lifted up even to the skies. Babylon is best known for its high tower. It represented world unity without obligation to God. This is the kingdom that Satan longs for. Today, Mecca and Dubai stand for the same thing. They have built their towers to heaven. Their judgment will match. In Bible prophecy “many waters” often pertains to “many nations”. This can describe the nations of the world today that are imbibed with Babylonian ideals. It is also appropriate to describe Dubai’s situation as it is built on the Arabian Sea with many man-made islands. One could easily describe Mecca or Dubai as “abundant in treasures”. As it was in Babylon it will be in Mystery Babylon. The Dubai Tower (Burj Khalifa) is the tallest in the world at 2,684 feet. The Abraj Al Bait Tower (or the Mecca Clock Tower) is a building complex in Mecca, Saudi Arabia. It is the worlds second tallest building at 1,972 feet. It has the largest floor area of any structure in the world. The princes of Babylon got drunk out of Israel’s holy vessels. God will give them their desires. They will drink and never awake from their stupor. As it was in Babylon it will be in Mystery Babylon. Watch “Dubai: a Case for Mystery Babylon” part 1 and part 2 on YouTube! What has God got in store for america? with all the terrible stuff under O bama , how can it continue on this course? Hi Robert. The US probably won’t fare well. I guess that’s why Jesus will take his Church away from the Tribulation. Is the death of Jamal Khashoggi the beginning of trouble tor Saudi Arabia ? Turkey is using the Khashoggi case to undermine Saudi Arabia as the head of Islam. Erdogan wants to be the Sultan of the Islamic world.